This article is about the medieval Abbasid Library, Baghdad. For the ancient Fatimid university, see House of Knowledge. The House of Wisdom (Arabic: بيت الحكمة‎; Bayt al-Ḥikmah) refers either to a major Abbasid public academy and intellectual center in Baghdad or to a large private library belonging to the Abbasid Caliphs during the Islamic Golden Age. The House of Wisdom is the subject of an active dispute over its functions and existence as a formal academy, an issue complicated by a lack of physical evidence following the collapse of the Abbasid Caliphate and a reliance on corroboration of literary sources to construct a narrative. The House of Wisdom was founded either as a library for the collections of the Caliph Harun al-Rashid in the late 8th century and later turned into a public academy during the reign of Al-Ma'mun or was a private collection created by Al-Mansur (reign 754–775) to house rare books and collections of poetry in both Arabic and Persian. Regardless, the House of Wisdom existed as a part of the major Translation Movement taking place during the Abbasid Era, translating works from Greek and Syriac to Arabic, but it is unlikely that the House of Wisdom existed as the sole center of such work, as major translation efforts arose in Cairo and Damascus even earlier than the proposed establishment of the House of Wisdom. This translation movement lent momentum to a great deal of original research occurring in the Islamicate world, which had access to texts from Greek, Persian and Indian sources, as opposed to the "Bookshelf Thesis" that reduces the contributions of Islamicate scholars to mere translation and preservation of Greek texts. 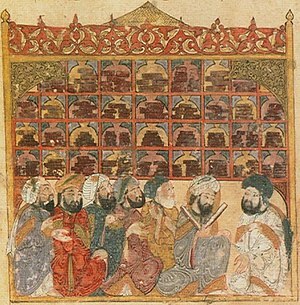 Illustration of the House of Wisdom in Baghdad. The House of Wisdom was made possible by the consistent flow of Arab, Persian, and other scholars of the Islamicate world to Baghdad, owing to the city's position as capital of the Abbasid Caliphate. This is evidenced by the large number of scholars known to have studied in Baghdad between the 8th and 13th centuries, such as Al-Jahiz, Al-Kindi, and Al-Ghazali among others, all of whom would have contributed to a vibrant academic community in Baghdad, producing a great number of notable works, regardless of the existence of a formal academy. The fields to which scholars associated with the House of Wisdom contributed include, but are not limited to philosophy, mathematics, medicine, astronomy, and optics. The early name of the library, Khizanat al-Hikma (literally, "Storehouse of Wisdom"), derives from its function as a place for the preservation of rare books and poetry, a primary function of the House of Wisdom until its destruction. The House of Wisdom and its contents were destroyed in the Siege of Baghdad (1258), leaving very little in the way of archaeological evidence for the House of Wisdom, such that most knowledge about it is derived from the works of contemporary scholars of the era such as Al-Tabari and Ibn al-Nadim. The earliest scientific manuscripts originated in the Abbasid era. Throughout the 4th to 7th centuries, scholarly work in the Arabic languages was either newly initiated, or carried on from the Hellenistic period. Centers of learning and of transmission of classical wisdom included colleges such as the School of Nisibis and later the School of Edessa, and the renowned hospital and medical academy of Jundishapur; libraries included the Library of Alexandria and the Imperial Library of Constantinople; and other centers of translation and learning functioned at Merv, Salonika, Nishapur and Ctesiphon situated just south of what was later to become Baghdad. During the Umayyad era, Muawiyah I started to gather a collection of books in Damascus. He then formed a library that were referred to by the name of "Bayt al-Hikma". Books written in Greek, Latin, and Persian in the fields of medicine, alchemy, physics, mathematics, astrology and other disciplines were also collected and translated by Muslim scholars at that time. Remarkably, the Umayyads also appropriated paper-making techniques from the Chinese and joined many ancient intellectual centers under their rule, and employed Christian and Persian scholars to both translate works into Arabic, and to develop new knowledge. These were fundamental elements that contributed directly to the flourishing of scholarship in the Arab world. In 750, the Abbasid dynasty replaced the Umayyad as the ruling dynasty of the Islamic Empire, and, in 762, the caliph al-Mansur (r. 754 – 775) built Baghdad and made it his capital, instead of Damascus. Baghdad's location and cosmopolitan population made the perfect location for a stable commercial and intellectual center. The Abbasid dynasty had a strong Persian bent, and adopted many practices from the Sassanian Empire – among those, that of translating foreign works, except that now texts were translated into Arabic. For this purpose, al-Mansur founded a palace library, modeled after the Sassanian Imperial Library, and provided economic and political support to the intellectuals working there. He also invited delegations of scholars from India and other places to share their knowledge of mathematics and astronomy with the new Abbasid court. In the Abbasid Empire, many foreign works were translated into Arabic from Greek, Chinese, Sanskrit, Persian and Syriac. The Translation Movement gained great momentum during the reign of caliph al-Rashid, who, like his predecessor, was personally interested in scholarship and poetry. Originally the texts concerned mainly medicine, mathematics and astronomy; but, other disciplines, especially philosophy, soon followed. Al-Rashid's library, direct predecessor to the House of Wisdom, was also known as Bayt al-Hikma or, as the historian Al-Qifti called it, Khizanat Kutub al-Hikma (Arabic for "Storehouse of the Books of Wisdom"). Under the sponsorship of caliph al-Ma'mun (r. 813 – 833), economic support of the House of Wisdom and scholarship in general was greatly increased. Furthermore, Abbasid society itself came to understand and appreciate the value of knowledge, and support also came from merchants and the military. It was easy for scholars and translators to make a living and an academic life was a symbol of status; scientific knowledge was considered so valuable that books and ancient texts were sometimes preferred as war booty rather than riches. Indeed, Ptolemy's Almagest was claimed as a condition for peace by al-Ma'mum after a war between the Abbasids and the Byzantine Empire. The House of Wisdom was much more than an academic center removed from the broader society. Its experts served several functions in Baghdad. Scholars from the Bayt al-Hikma usually doubled as engineers and architects in major construction projects, kept accurate official calendars, and were public servants. They were also frequently medics and consultants. Al-Ma'mum was personally involved in the daily life of the House of Wisdom, regularly visiting its scholars and inquiring about their activities. He would also participate in and arbitrate academic debates. Inspired by Aristotle, al-Mamum regularly initiated regular discussion sessions and seminars among experts in kalām. Kalām is the art of philosophical debate that al-Mamm carried on from his Persian tutor, Ja’far. During debate, scholars would discuss their fundamental Islamic beliefs and doctrines in an open intellectual atmosphere. Furthermore, he would often organize groups of sages from the Bayt al-Hikma into major research projects to satisfy his own intellectual needs. For example, he commissioned the mapping of the world, the confirmation of data from the Almagest and the deduction of the real size of the Earth (see section on the main activities of the House). He also promoted Egyptology and participated himself in excavations of the pyramids of Giza. Al-Ma’mum built the first astronomical observatories in Baghdad, and he was also the first ruler to fund and monitor the progress of major research projects involving a team of scholars and scientists. His greatest legacy to science is that he was the first ruler to fund "big science". Al Ma'mun sends an envoy to the Byzantine Emperor Theophilos. Following his predecessors, al-Ma'mum would send expeditions of scholars from the House of Wisdom to collect texts from foreign lands. In fact, one of the directors of the House was sent to Constantinople with this purpose. During this time, Sahl ibn Harun, a Persian poet and astrologer, was the chief librarian of the Bayt al-Hikma. Hunayn ibn Ishaq (809–873) an Arab Nestorian Christian physician and scientist, was the most productive translator producing 116 works for the Arabs. The patron of this foundation was under Caliphe al-Ma'mum. Al-Ma'mum established the House of Wisdom, putting Hunayn ibn Ishaq in charge, who then became the most celebrated translator of Greek texts. As "Sheikh of the translators" he was placed in charge of the translation work by the caliph. Hunayn ibn Ishaq translated the entire collection of Greek medical books, including famous pieces by Galen and Hippocrates. The Sabian Thābit ibn Qurra (826–901) also translated great works by Apollonius, Archimedes, Euclid and Ptolemy. Translations of this era were superior to earlier ones, since the new Abbasid scientific tradition required better and better translations, and the emphasis was many times put in incorporating new ideas to the ancient works being translated. By the second half of the ninth century al-Ma'mun's Bayt al-Hikma was the greatest repository of books in the world and had become one of the greatest hubs of intellectual activity in the Middle Ages, attracting the most brilliant Arab and Persian minds. The House of Wisdom eventually acquired a reputation as a center of learning, although universities as we know them did not yet exist at this time — knowledge was transmitted directly from teacher to student, without any institutional surrounding. Maktabs soon began to develop in the city from the 9th century on, and in the 11th century, Nizam al-Mulk founded the Al-Nizamiyya of Baghdad, one of the first institutions of higher education in Iraq. The House of Wisdom flourished under al-Ma'mun's successors al-Mu'tasim (r. 833 – 842) and his son al-Wathiq (r. 842 – 847), but considerably declined under the reign of al-Mutawakkil (r. 847–861). Although al-Ma'mun, al-Mu'tasim, and al-Wathiq followed the sect of Mu'tazili, which supported mind-broadness and scientific inquiry, al-Mutawakkil endorsed a more literal interpretation of the Qur'an and Hadith. The caliph was not interested in science and moved away from rationalism, seeing the spread of Greek philosophy as anti-Islamic. Hulagu Khan's siege of Baghdad (1258). On February 13, 1258, the Mongols entered the city of the caliphs, starting a full week of pillage and destruction. With all other libraries in Baghdad, the House of Wisdom was destroyed by the army of Hulagu during the Siege of Baghdad. The books from Baghdad’s libraries were thrown into the Tigris River in such quantities that the river ran black with the ink from the books. Nasir al-Din al-Tusi rescued about 400,000 manuscripts which he took to Maragheh before the siege. The House of Wisdom included a society of scientists and academics, a translation department and a library that preserved the knowledge acquired by the Abbasids over the centuries. They also researched and studied alchemy, which was later used to create the structure of modern chemistry. Furthermore, linked to it were also astronomical observatories and other major experimental endeavors. Institutionalized by Al-Ma'mun, the academy encouraged the transcription of Greek philosophical and scientific efforts. Additionally, he imported manuscripts of important texts that were not accessible to the Islamic countries from Byzantium to the library. The House of Wisdom was much more than a library, and a considerable amount of original scientific and philosophical work was produced by scholars and intellectuals related to it. This allowed Muslim scholars to verify astronomical information that was handed down from past scholars. 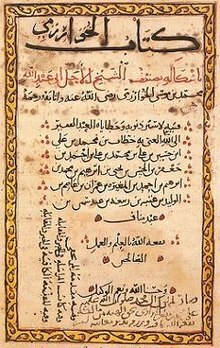 13th-century Arabic translation of De Materia Medica. The Translation Movement started in this House of Wisdom and lasted for over two centuries. Over a century and a half, primarily Middle Eastern Oriental Syriac Christian scholars translated all scientific and philosophic Greek texts to Arabic language in the House of Wisdom. The translation movement at the House of Wisdom was inaugurated with the translation of Aristotle's Topics. By the time of al-Ma'mun, translators had moved beyond Greek astrological texts, and Greek works were already in their third translations. Authors translated include: Pythagoras, Plato, Aristotle, Hippocrates, Euclid, Plotinus, Galen, Sushruta, Charaka, Aryabhata and Brahmagupta. Many important texts were translated during this movement including a book about the composition of medicinal drugs, a book on this mixing and the properties of simple drugs, and a book on medical matters by Pedanius Dioscorides. These, plus many more translations, helped with the advancements in medicine, agriculture, finance, and engineering. Furthermore, new discoveries motivated revised translations and commentary correcting or adding to the work of ancient authors. In many cases names and terminology were changed; a prime example of this is the title of Ptolemy's Almagest, which is an Arabic modification of the original name of the work: Megale Syntaxis. A page from al-Khwarizmi's Kitab al-Jabr. Drawing of Self trimming lamp in Ahmad ibn Mūsā ibn Shākir's treatise on mechanical devices. Al-Idrisi's map of the world (12th). Note South is on top. Besides their translations of earlier works and their commentaries on them, scholars at the Bayt al-Hikma produced important original research. For example, the noted mathematician al-Khwarizmi worked in al-Ma'mun's House of Wisdom and is famous for his contributions to the development of algebra. Muhammad ibn Musa al-Khwarizmi was born around 780 and died around 850. He was known as a mathematician and an astronomer in the House of Wisdom, and is also known for his book Kitab al-Jabr in which he develops a number of algorithms. The application of the word "algebra" to mathematics and the etymology of the word "algorithm" can be traced back to al-Khwarizmi — the actual concept of an algorithm dates back before the time of Euclid. The term 'algorithm' is derived from a Latin version of al-Khwarizmi's name which is 'Algorithmus'. He was instrumental in introducing the Arabs to Hindu numerals and algebra so he is known as "The Father of Algebra". 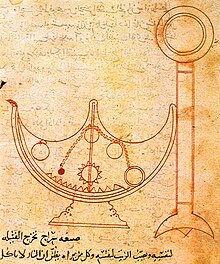 Additionally, al-Khwarizmi wrote about the astrolabe, sundial, and elaborated on Ptolemy's geometric model. Al-Khwarizmi is also known as the first geographer of Islam with his famous Picture of the Earth treatise. In Picture of the Earth, he arranged the coordinates of hundreds of cities in the world at that time and gave instructions for drawing a new map of the world. George Sarton, one the most famous historians of science known for his book, Introduction to the History of Science, called the period between 800 and 850 AD "The Time of al-Khwarizmi". Besides that, this mathematician is responsible for the introduction of the Hindu decimal system to the Arab world, and through it to Europe. Al-Kindi also made important breakthroughs in cryptanalysis. In al-Khwarizmi's early career, he proposed ideas towards the Hindu astronomical tables known as Sindhind. As a result, Caliph Al-Ma'mun sought al-Khwarizmi out to work on the science of equations. Abu Yusuf Ya‘qub ibn Ishaq Al-Kindi was also another historical figure that worked at the House of Wisdom. He studied cryptanalysis but he was also a great mathematician. Al-Kindi is the most famous for being the first person to introduce Aristotle's philosophy to the Arabic people. He fused Aristotle's philosophy with Islamic theology which created an intellectual platform for philosophers and theologians to debate over 400 years. A fellow expert on Aristotle was an East African descent named Abu Uthman al-Jahith who was born in Basra around 776 but he spent most of his life in Baghdad. Al-Ma’mun employed al-Jahith as a personal tutor for his children, but he had to dismiss him because al-Jahith was "Goggled-Eyed", i.e., he had wide, staring eyes which made him frightening to look at. Al-Jahith was one of the few Muslim scholars who was deeply concerned with biology. He wrote Book of Animals, which discusses the way animals adapt to their surroundings, similarly to Aristotle's History of Animals. In his book, al-Jahith argued that animals like dogs, foxes, and wolves must have descended from a common ancestor because they shared similar characteristics and features such as four legs, fur, tail, and so on. Mūsā ibn Shākir was an astrologer, and a friend of Caliph Harun al-Rashid's son, al-Ma'mun. His sons, collectively known as the Banū Mūsā (Sons of Moses), also contributed with their extensive knowledge of mathematics and astrology. When their father died, al-Ma'mun became their guardian. Between 813 and 833, the three brothers were successful in their works in science, engineering, and patronage. Abū Jaʿfar, Muḥammad ibn Mūsā ibn Shākir (before 803 – February 873), Abū al‐Qāsim, Aḥmad ibn Mūsā ibn Shākir (d. 9th century) and Al-Ḥasan ibn Mūsā ibn Shākir (d. 9th century) are widely known for their Book of Ingenious Devices, which describes about one hundred devices and how to use them. Among these was "The Instrument that Plays by Itself", the earliest example of a programmable machine, as well as the Book on Measurement of Plane and Spherical Figures. Mohammad Musa and his brothers Ahmad and Hasan contributed to Baghdad's astronomical observatories under the Abbasid Caliph al-Ma'mun, in addition to the House of Wisdom research. Having shown much potential, the brothers were enrolled in the library and translation center of the House of Wisdom in Baghdad. They began translating ancient Greek into Arabic after quickly mastering the language, as well as paying large sums to obtain manuscripts from the Byzantine Empire for translation. There also made many original contributions to astronomy and physics. Mohammad Musa might have been the first person in history to point to the universality of the laws of physics. In the 10th century, Ibn al-Haytham (Alhazen) performed several physical experiments, mainly in optics, achievements still celebrated today. In medicine, Hunayn wrote an important treatise on ophthalmology. Other scholars also wrote on smallpox, infections and surgery. Note that these works would later become standard textbooks of medicine during the Renaissance. Under al-Mamun's leadership science saw for the first time wide-ranging research projects involving large groups of scholars. In order to check Ptolemy's observations, the caliph ordered the construction of the first astronomical observatory in Baghdad (see Observatories section below). The data provided by Ptolemy was meticulously checked and revised by a highly capable group of geographers, mathematicians and astronomers. Al-Mamun also organized research on the circumference of the Earth and commissioned a geographic project that would result in one of the most detailed world-maps of the time. Some consider these efforts the first examples of large state-funded research projects. The creation of the first astronomical observatory in the Islamic world was ordered by caliph al-Mamun in 828 in Baghdad. The construction was directed by scholars from the House of Wisdom: senior astronomer Yahya ibn abi Mansur and the younger Sanad ibn Ali al-Alyahudi. It was located in al-Shammasiyya and was called Maumtahan Observatory. After the first round of observations of Sun, Moon and the planets, a second observatory on Mount Qasioun, near Damascus, was constructed. The results of this endeavor were compiled in a work known as al-Zij al-Mumtahan, which translates as "The Verified Tables". Not only did the Muslims in this era build observatories but soon after in Central Asia, they built a paper mill, which then led to the production of dyes, inks, glues, and even book bindings. Yale University Arabist Dimitri Gutas disputes the existence of the House of Wisdom as is its form and function. He posits in his 1998 book that "House of Wisdom" is a translation error from Khizanat al-Hikma, which he asserts simply means a storehouse, and that there are few sources from the era during the Abbasid Era that mention the House of Wisdom by the name Bayt al-Hikma. Gutas asserts that without consistent naming conventions, a physical ruin, or corroborating texts, the phrase "House of Wisdom" may just as well have been a metaphor for the larger Academic community in Baghdad rather than a physical academy specializing in translation work. This theory is debatable, owing to the destruction of the Round city of Baghdad and conflicting sources in both academic texts and poetry. It is likely, given the Abbasid Caliphs' patronage of the arts and sciences, that an extensive library existed in Baghdad, and that scholars could have access to such texts, judging by the volume of work produced by scholars centered in Baghdad. This is a list of notable people related to the House of Wisdom and the rise of Arab science. Hunayn ibn Ishaq (809–873) - Mesopotamian scholar and philosopher who was placed in charge of the House of Wisdom. (Assyrian-Nestorian) In his lifetime he translated over 116 writings by many of the most significant scholars in history. Thābit ibn Qurra (826–901) - mathematician and astronomer who reformed Ptolemaic system. Considered as the founding father of statics. Qusta Ibn Luqa (820–912) - mathematician and physician who translated Greek texts into Arabic. In Cairo, Dar al-Hikmah, the "House of Wisdom", was another name of the House of Knowledge, founded by the Fatimid Caliph Al-Hakim bi-Amr Allah in 1004. Included in this House of knowledge was a library that had a collection so vast, it was known as a "Wonder of the world". There is a research institute in Baghdad called Bayt al-Hikma after the Abbasid-era research center. While the complex includes a 13th-century madrasa, it is not the same building as the medieval Bayt al-Hikma. It was damaged during the 2003 invasion of Iraq 33°20′32″N 44°23′01″E﻿ / ﻿33.3423°N 44.3836°E﻿ / 33.3423; 44.3836. The House of Wisdom was similar to that of the present day British Library in London or the National Library in Paris. The main library at Hamdard University in Karachi, Pakistan is called 'Bait al Hikmah'. International NGO based in France, La Maison de Sagesse. The Royal Library of Alexandria is located in Alexandria, Egypt. In the ancient world, it was once known as not only the most significant library but also the largest. The library was created by Ptolemy I Soter and its construction was done in the 3rd century BC and the library was dedicated to Muses, the nine goddesses of the arts. After many years of accumulating scrolls adding up to anywhere from 40,000 to 400,000 the library was burned down. This caused the loss of many important scrolls and cultural knowledge. Located in the Byzantine Empire and founded by Constantius II, The Imperial Library of Constantinople was famously known as last of the great ancient libraries. It housed a lot of knowledge of the Greek and Roman people. This library also experienced fires throughout its lifetime ending with the final destruction during the conquering by the Ottoman Empire. Most of the classical Greek work that we know today is originally from this library. The School of Nisibis was founded in 350 and was located in what is known as present-day Turkey. This was a spiritual center that had three primary departments, theology, philosophy, and medicine. ^ a b c d e f Dimitri Gutas (1998). Greek Thought, Arabic Culture: The Graeco-Arabic Translation Movement in Baghdad and Early ʻAbbāsid Society (2nd–4th/8th–10th Centuries). Psychology Press. pp. 53–60. ISBN 978-0-415-06132-2. ^ a b c d e f g Jim Al-Khalili (31 March 2011). "5: The House of Wisdom". The House of Wisdom: How Arabic Science Saved Ancient Knowledge and Gave Us the Renaissance. Penguin Publishing Group. p. 53. ISBN 978-1-101-47623-9. ^ a b c d Brentjes, Sonja; Morrison, Robert G. (2010). "The Sciences in Islamic Societies". The New Cambridge History of Islam. 4. Cambridge: Cambridge University Press. p. 569. ^ a b c d Pormann, Peter E.; Savage-Smith, Emilie (2007). Medieval Islamic medicine. Washington, D.C.: Georgetown University Press. pp. 20–29. ISBN 9781589011601. OCLC 71581787. ^ a b c d Lyons, Jonathan (2009). The house of wisdom : how the Arabs transformed Western civilization. New York: Bloomsbury Press. ISBN 9781596914599. ^ Kaser, Karl The Balkans and the Near East: Introduction to a Shared History Archived 2015-11-28 at the Wayback Machine p. 135. ^ Meri, Josef W. and Jere L. Bacharach. “Medieval Islamic Civilization”. Vol. 1 Index A – K. 2006, p. 304. ^ "Wiet. Baghdad". Archived from the original on 2010-01-07. Retrieved 2006-12-22. ^ Joseph A. Angelo (14 May 2014). Encyclopedia of Space and Astronomy. Infobase Publishing. p. 78. ISBN 978-1-4381-1018-9. ^ Iskandar, Albert Z. (2008). "Ḥunayn Ibn Isḥāq". In Selin, Helaine. Encyclopaedia of the History of Science, Technology, and Medicine in Non-Western Cultures. doi:10.1007/978-1-4020-4425-0_9796. ISBN 978-1-4020-4559-2. ^ Gingerish, Owen (April 1986). "Islamic Astronomy". 4. 254: 74–83. ^ "The Mongol Invasion and the Destruction of Baghdad". Lost Islamic History. Archived from the original on 2016-08-14. Retrieved 2014-10-27. ^ Adamson, London Peter The Great Medieval Thinkers: Al-Kindi Oxford University Press, New York, 2007, p. 6. London Peter Adamson is a Lecturer in Late Ancient Philosophy at King's College. ^ A. B. Arndt (December 1983). "Al-Khwarizmi". The Mathematics Teacher. 76 (9): 668. JSTOR 27963784. ^ FSTC. "The Mechanics of Banu Musa in the Light of Modern System and Control Engineering". www.muslimheritage.com. Foundation for Science Technology and Civilisation (FSTC). Archived from the original on 2018-04-25. Retrieved 25 April 2018. ^ Ehsan Masood (5 November 2009). Science & Islam: A History. Icon Books Limited. pp. 161–163. ISBN 978-1-84831-160-2. ^ Lyons, Jonathan (2014). "Bayt al-Hikmah". In Kalin, Ibrahim. The Oxford Encyclopedia of Philosophy, Science, and Technology in Islam. Oxford: Oxford University Press. ^ John L. Esposito (6 April 2000). The Oxford History of Islam. Oxford University Press. p. 160. ISBN 978-0-19-988041-6. ^ Holme, Audun (2010). Geometry : our cultural heritage (2nd ed.). Berlin: Springer. ISBN 9783642144417. OCLC 676701072. ^ "PRIX INTERNATIONAL MÉMOIRE POUR LA DÉMOCRATIE ET LA PAIX 2016 : La Maison de la Sagesse présélectionnée | Le Mauricien". www.lemauricien.com (in French). 2016-04-12. Archived from the original on 2017-09-13. Retrieved 2017-09-13. Koetsier, Teun (2001), "On the prehistory of programmable machines: musical automata, looms, calculators", Mechanism and Machine Theory, 36 (5): 589–603, doi:10.1016/S0094-114X(01)00005-2. Gutas, D. (2012). Greek Thought, Arabic Culture. The Graeco-Arabic Translation Movement in Baghdad and Early 'Abbasaid Society (2nd-4th 5th-10th centuries). Routledge.